May I giggle a little? There now seems to be a scientific verdict on the age old question of what came first. The favors go to the egg. It takes some reasoning, but in brief I understand it is as follows. Genetic material does not change during an animal's life. Therefore the first bird that evolved into what we would call a chicken, probably in prehistoric times, must have first existed as an embryo inside an egg (CNN Science, 29th May 2006). In my view this reasoning comes very close to yet another version of creationism. It is alright to be filosofical about the chicken and the egg and maintain strong convictions about the prevailence of one or the other, as long as you stay away from claiming either proposition as the truth. Of all questions, the matter concerning the chicken and the egg is destined to be eternal. It is part of our humanity that we never claim the answer. So it was a mistake to throw science into it altogether. And to come out with an answer like this is a blasphemy. Only in theory there is some bird we could call ‘the first chicken’, as only in theory we could contemplate the first human. 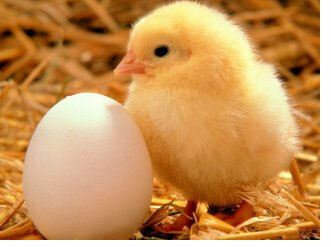 Every first chicken will first have to be constructed out of the genetic material provided by the parent birds. They can’t simply not have been chickens as they probably were not any other bird either – or any bird we know. At another level, the answer science has so painstaikingly found is obviously correct – of course. You don’t need science for that. Whatever chicken came out first, it could only have come from an egg. Everybody knows that. So, it is not the answer that makes the subject so endlessly interesting. Why would anything so obvious even raise an eyebrow? Our scienctists in fact made pretty fools of themselves both by claiming the answer and by taking hold of the question. They shouldn’t have. They should have left the issue where it belongs: in the realm of filosofy, in that space of our mind where we can still entertain our fantasies, our power of imagination beyond the obvious. That is what makes the chicken so important. The true question is about the origin and meaning of life. Therefore, in the name of our humanity, we should hold it eternally possible that the chicken came first as much as the egg.